3 Lasers traveled to Fishers Green Sailing Club on Saturday 27th June and were greeted with bacon butties, hot sun and a gentle breeze. There were 20 boats entered 7 of which were visitors. They have a large lake with numerous islands to navigate around which made for challenging moves down the runs to see which side of them to go. Local knowledge prevailed here big time as the wind shifts were massive, and getting on the wrong side of one cost you many places as i found out to my cost a few times ! This really is a lovely small friendly club who were very appreciative of us attending, i really would recommend it as one to do again next year. Well done to Chris Tillyer who scored a 2,3,2,3 to secure 2nd overall from the club hotshot. I had a 10,8,7,6 for 8th overall, and Jeremy Doran had a 13,12,13,15 for 12th overall, and is improving at every event he attends. I would like to let anyone know who was thinking of dining with us today that unfortunately I am not able to open the kitchen today. Normal service will be resumed again tomorrow, Wednesday, all being well. Please note the Commodore Bar will be closed until Saturday 4th July due to the ceiling being replaced. We will do our best to keep any disruption to the minimum and we ask members to bear with us during this refurbishment. We need your help and for many of our members it is something you like doing. Every year we produce Newsbuoys and a Calendar which all depend on a good selection of photograph of all our social and racing events through the year, unfortunately our stock is beginning to dry up and so we need you to take some and send them in. Every quarter we will select the best who will win a small prize. This Sunday is our next session in the ‘New Cadet Race’ Series. Let’s have a big turn-out!!!! The race will be a windward leeward course starting at the committee boat. It will be the second start with the Fast and Slow Monohulls at 09.03. (Time plus 3 minutes). 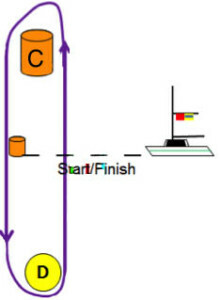 On the starting signal, you will cross the line and beat to the CADET BUOY, which is a special buoy marked with a C. This will be your windward mark. Check whether a Red or Green flag is displayed on the Committee boat; Red leave marks to port, Green leave marks to starboard. We require a helm for SS3 this Sunday. Race starts at 2:30pm. If you can help please contact the Duty Officer Paul Morgan on 07741 201052 or volunteer directly on DutyMan. Your help would be appreciated. I would just like to formally thank Steve, Karen and their team for a seamless and professional service last night and for the incredible efforts they put into the preparation in the weeks before – Karen was an absolute star. I have had many people comment to me today on how delicious the food was, how efficient and friendly service was and what a delight it was to enjoy such a fantastic meal. We are very lucky to have great caterers who work extremely hard to deliver the perfect event for us – the best one we’ve had in years! Grateful thanks to Lorraine and her bar team for their equally seamless and professional service and hard work. No-one waited long for drinks, empties were cleared efficiently and the atmosphere was a fun and friendly one. I also think everyone will agree how brilliant everyone looked in their standard smart black uniforms with gold ties and bow ties. It tied everything together and made for a very professional feel to the evening.